Another excellent piece of work from the lovely and talented Colleen Ponce. Hi Colleen. I found you because you subscribed to my blog. Thank you. I love this sketch. My little dog is a Tibetan Spaniel and is about the size of Chloe’s head. wow. Thats amazing! Thanks for suscribe to my blog! if you have something that you feel i write too little about or anything that can change, write to me and let me know! Thank you and again really nice job on thins painting! We have a female bulldog named Bessie. She’s about eight years old. We rescued her. I think she looks a lot like Chloe. We had a male bulldog named Bagel who lived to be 15 years old. Bulldogs are something else. Bessie doesn’t like to get much exercise. It’s often an effort to get her to walk around the block, but she’s very loving. She feels like the reincarnated spirit of Bagel. We waited five years after Bagel died before adopting Bessie. She was about five or six when we adopted her. Anything’s possible, I suppose. Nice work! I thought it was a real photo. What a precious pet portrait! I love it! You have really captured the dog’s essence and personality. Outstanding job detailing his fur….that can be difficult. Thanks for subscribing to my blog. This is amazing, Colleen! That is some look Chloe has on her face and you captured it perfectly!!! Thanks for subscribing to my blog, too! I love this picture – I, too, thought it was a photograph. You are one talented girl! I’m glad you subscribed to my blog – otherwise, I wouldn’t have had the pleasure of seeing what you do. I love this dog. So amazing. This pictures spoke to me. Bulldogs have such character, don’t they? This is incredible. I had to spend a few minutes convincing myself that this wasn’t just a desaturated photograph. Again, excellent work. You have captured the “Bulldogness” of a Bulldog! 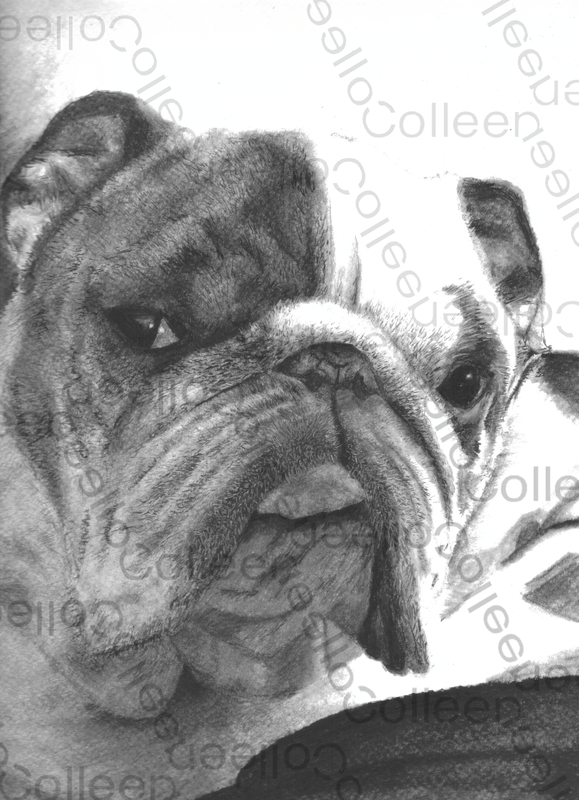 The bulldog in your sketch has aliveness and animation. It conveys babylike innocence. Whoa, you’re talented! Very impressive! You do incredible work! Your drawings take my breath away. I have a wonderful connection with animals and you capture their essence so beautifully. Beyond awesome! Art at its beat in my eyes! Oh my goodness Colleen! Do you do portraits from photos? I have some munchkins that would keep you busy. Beautiful! I love the look the pup is giving–such a sweet face, little bit sneaky and lot bit cute! Thanks for checking out my site! hehee i look at this dog and he makes me smile. That is Art! Whatever can move you to feel any type of emotion, is good Art! Great job! I like this very much! ALL your drawings are EXCELLENT! Good idea! Much less maintenance!!!! Wow!!! I thought this was a black & white Photograph. It’s perfect! This is gorgeous, I thought it was a black and white photograph until I looked again. Truly beautiful and you can see the life in her eyes! Thanks… I can’t believe so many people think that these are photos 🙂 I guess I really am my own worst critic!! This is phenomenal. I thought your drawings were black and white photos. You have wonderful talent. I wish I could draw like this. 🙂 I am glad this picture seems so animated to you! Love this one. You do a great job at bringing them to life. Gorgeous – I love the detail. You’re amazing! I wish I could draw like this! This is a fantastic drawing, it has so much personality and expressiveness. Plus, what a tremendous amount of patience to render this in carbon. I love this sketch. I feel like the dog could walk right off the page. This is wonderful, I wanna be friends with your dog. You are very talented. Chloe is so precious. Love your work. He’s ADORABLE!! You are very talented!